We realise that not everybody can afford to purchase a new Cures and Enhancers kit each year and while the cures from the previous year will not be as effective, we have still found a way for you to implement the cures into your home for 2019. I know most Feng Shui websites and books will say that you should not reuse at all and throw away or bury three feet into the ground as the previous year’s kit stores so much collective negative energy, I do not like to advise this as I know that there are still many people who cannot afford to replace the kit each year and you will always find alternatives in our advice that everyone can implement a cure regardless if they use the kits or not. 1 x huaxianweiyi Sheng Chi Cure (SC2018) This must be replaced with the 2019 Sheng Chi Cure. Please do not throw this away as it makes a great cure to cleanse and pass down in the family. 1 x Master cure (jiebaopinchuan) (MC2018) This must be replaced with the 2019 Master Cure. Please do not throw this away as it makes a great cure to cleanse and pass down in the family. 1 x Jiang Wu Tai Sui gold plated plaque (TSC18) This must be replaced with a Xie Tai Tai Sui plaque for 2019 . Please do not throw this away as it makes a great cure to cleanse and pass down in the family. The wind chime and a salt water cure should be placed in the southwest of the property as the 5 Yellow star (Wu Wang), which is not a good star located in this area. You should also place some metal objects here to weaken further. #2 Black flying star is located in the northeast in 2019. Hang your six Chinese coins and place your salt water cure, you can also place metal objects to weaken the bad earth. Looking at the chart above, you will see that we have the #2 black star enter the northeast of the lo shu in 2019 and we are going to need special cures and enhancers in the northeast to weaken the malevolent influence of this star. At the least, I would hang a set of six Chinese coins tied with red ribbon and also place a salt water cure in the northeast and southwest in 2019 to control and weaken the annual #2 and #5 stars. For full details on 2019 flying star analysis follow this link. This is very important in 2019 especially if you have the main door, bedroom, office, lounge or other important room in the southwest, south, southeast or northeast. 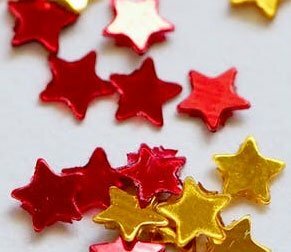 This is just a small part of what you can do to ensure 2019 will be a good year and to enhance 2019 further I would suggest checking out the monthly almanac, flying stars and animal predictions as it not only recommends good and bad days to carry out certain tasks, it will also advise if it is good for your animal sign. 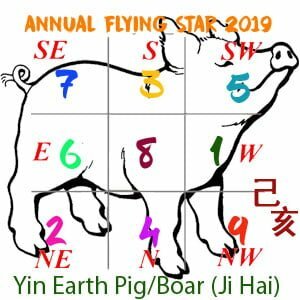 If you would like to be informed in advance of the monthly, annual and fixed flying stars giving you the ultimate control of your home or business, you should consider our 2019 advanced Feng Shui software; it is used by thousands of Feng Shui Masters, Practitioners and students throughout the world. Combining this with our new incredible and extremely powerful Tong Shu Almanac date selection software this will make 2019 a better year indeed. It’s essential you avoid making any form of deafening renovations or re-decorative work in the west part of your home or office between 4th February 2019 and 3rd February 2020. You should not disturb the ground by digging holes (small holes for plants is fine), build foundations or conduct any maintenance work with any loud equipment in the areas inside or outside your property or garden. If you have no option but to perform work in the west in 2019, I would recommend that you place a six hollow rod metal wind chime along with six Chinese I-Ching coins and a salt water cure in the west during 2019. We take this very seriously at the Feng Shui Store as we’ve seen some pretty nasty events over the past 38 years when this energy has been disturbed. There are also another two other rules that you should follow regarding the Three Killings in 2019. Firstly, if you are moving your desk around this year, never sit with your back towards the west, it is better to face west instead. If you have a door in the west in 2019, please take a lot of care when opening and closing the door to make sure it is not slammed. Settle and avoid the influence of the Three Killings by opening and shutting the door calmly or install a soft close hinge. Urgent repairs to your home or office in the west during 2019 will need a cure to prevent any negative consequences. You can place a six hollow metal rod wind chime between the building and where the work is being carried out or ideally, contact a professional Feng Shui Consultant to select an auspicious date to start the work. Our Tong Shui software will also easily calculate the perfect time for you. If your property or front door faces northwest in 2019, much like the Three Killings, you must try to avoid doors from slamming when entering or leaving your home or workplace. You should avoid digging or renovating your property in this area at all costs in 2019. If you have an office or shop door in the northwest this year, I would recommend installing a soft close attachment. The traditional Chinese method to appease Tai Sui is to place a Xie Tai Tai Sui plaque along with a Three immortals to pay respect and appease the Deity and also enhance the annual #9 star. By paying respect to Grand Duke of Jupiter, we can weaken or avoid the problems this can bring. Sui Po year breaker occupies the division directly opposite Tai Sui Grand Duke, which for 2019 is the southeast. You should treat this area the same as the other annual afflictions with no ground-breaking work, renovations or any loud activities. If disturbed, this area can and usually will cause immediate health problems especially with regards to the elderly, so please be very careful with the southeast of your home or office this year. Traditionally to appease Sui Po in a Pig year, you need to display a 9 Tier Wen Chang Pagoda which works to appease Sui Po and also weaken the annual #7 in 2019 which we have included in all of our 2019 Cures and Enhancers Kits. The annual five yellow has flown to the southwest in 2019, and this is not good and the reason why so many specialist cures are needed in 2019. It is highly recommended not to disturb the southwest of your home or business with noisy activities, renovations or maintenance work this year. When disturbed, the Five Yellow can bring disaster, sickness, lawsuit and major loss of wealth so please be very careful in the southwest in 2019 as it is very afflicted. In 2019 you must place a set of six Chinese i-ching coins tied with red ribbon, a six-rod hollow metal wind chime and a salt water cure in the southwest to avoid the problems that are associated the #5 yellow disaster star. Please do not start panicking if you have a bedroom or office that is located in the northeast, southeast, southwest or south in 2019; just start preparing to place your 2019 cures and enhancers kit as of the 4th February 2019 to ensure a trouble-free year and also cleanse any old cures that you will be reusing this year, and of course make sure you sign up for our free newsletter, so you are kept up to date with the monthly flying stars giving you even more control of your destiny. To give you even better control, use our advanced Feng Shui 2019 software as this gives an advanced analysis of every home or office facing any direction in any part of the world.